Tomorrow we are having a security camera system fitted, last night the lad finally, let me know how big a shelf I needed for the DVR, 30cm x 30cm so it had to be something simple, and quick. 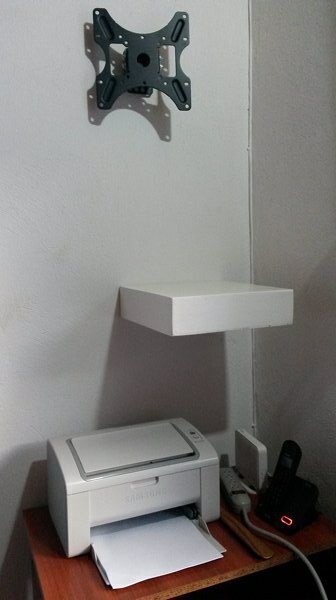 I haven't made a floating shelf before, but I have seen it done many times, and it seemed simple enough, so I went for that. 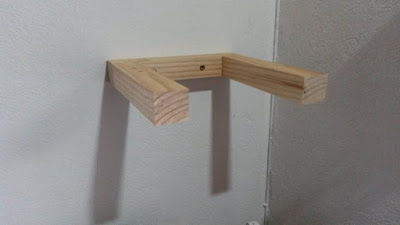 To make the bracket for the shelf, I ripped a piece of scrap 2 x 4 in half, and cut it into three pieces, these would make the 'U' support for the shelf. There is nothing complicated about it, I screwed the arms onto the back bar, from behind, drilling the screw holes first, so they wouldn't split. At the same time, I drilled the two holes to screw the bracket to the wall, using 3 1/2" screws. The only important part, was making sure that the arms were 90° to the rear bar. Having made the bracket I measured it, and then sorted out some scrap plywood, from which I cut a top and a bottom, two sides, and the front. the back remains open, so it will slide over the support arms up to the wall. These were all glued and brad nailed together, to make the 'box'. I then used wood filler to fill in the nail holes, before sanding the whole box. and giving it two coats of emulsion. I used emulsion rather than gloss, because I could guarantee in drying in time, then to give the paint some protection, I used up a can of polyurethane spray, I had in the workshop. 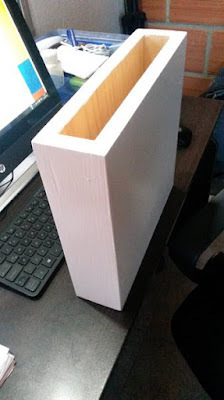 Once it was dry, it slid like a glove, onto the support, it doesn't need anything to hold it in place, because it is a snug fit, and therefore can be removed when I am painting the walls. All in all, it probably took me two hours labour time to complete, and using scrap, it cost me nothing.